Freelancing is particularly popular among the IT industry, with the number of professionals wanting to become a freelance designer growing each day. Results from a freelance survey show that around 70% of all freelancers are either designers, back-end engineers or mobile developers. And while the fastest-growing skill sets for freelancers are extremely diverse, both UI and UX design skills are among the top 20. These statistics alone highlight how crowded the freelance UI/UX designer market really is. Standing out from the crowd and offering a bespoke service are two of the most important factors when it comes to being a successful freelancer. However, it’s far from being that simple! Here are my top tips for becoming a successful freelancer. As a freelance designer in a crowded area, knowing how to market yourself is important. In fact, it’s quite possibly the most important thing. 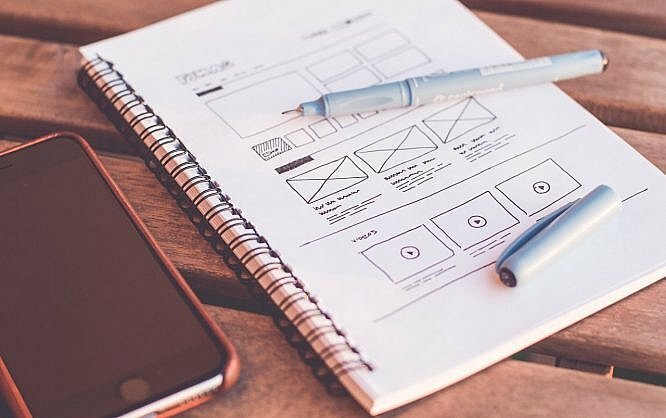 The rise of brand-new technologies has made it practically impossible to become a successful UX/UI designer without an outstanding online portfolio. I’m not going to bore you with all the intricate details, but it’s important that your portfolio engages with potential clients and represents your brand in a unique way. The main focal point of your portfolio should be your most impressive work samples. Making people aware of your brand is important too, so include your brand logo wherever you can. Once you’ve finished creating your portfolio, it’s time to market yourself as a freelancer. Social media marketing is one of the most effective forms of marketing, especially platforms such as Facebook, LinkedIn, Instagram, and YouTube. According to Optinmonster, video marketers achieve a 54% increase in brand awareness. That’s right, a whopping 54%! I can’t underline the importance of video marketing enough. UI and UX design are continuously evolving, therefore, it’s vital that you stay in touch with the latest trends and software. The online creative/tech community is home to thousands of creative professionals that you can learn from. Following industry influencers on Twitter and interesting UX/UI subreddits are just two great ways to network. Commenting on relevant posts is also rewarding, as this gives you the opportunity to communicate with other creative professionals. When you first start to interact with other designers, I understand that it can seem difficult to give your honest opinion because you lack confidence or experience. However, it’s important that you try, as this will help to build a positive reputation around yourself and your brand. Just because you begin networking online, it doesn’t mean it has to continue that way. Websites such as meetup.com give you the opportunity to meet up with other UI/UX designers in person. There are groups for all different skill levels and types – from experts to beginners. If you attend these meetings, it’s important that you get involved and try to be as proactive as possible. When you’re just starting out, it might even be the case that your first job is voluntary. This isn’t a bad thing, because being a successful freelance designer isn’t about making a ton of money in your first month of working. Being a successful freelance UI/UX designer is about perfecting your niche and providing outstanding services for your clients. Working on smaller jobs will build up a reputation around your brand, and could potentially lead to a higher paid job working for a bigger company. Also, if you’re new to UI/UX design, there’s a chance that you’re not the most confident or experienced designer out there. Accepting jobs which are too complex or challenging from the start could have a negative impact on your confidence, or worse, your future success. Some may say that word of mouth is everything as a freelancer, I say that they’re not wrong. Studies show that 73% of freelancers get their work through word of mouth. This statistic highlights the importance of going the extra mile for your clients. No matter how big or small the gesture, your client will almost definitely talk about it within the community. Whether your reading books, blog posts or listening to podcasts, it’s important as a creative that you’re continuously learning. One of the sites that I highly recommend is Lynda.com, which offers hundreds of online courses on everything from UX design to Visual design. Learning plays is a vital part of becoming a successful UI/UX freelance designer. Both UI/UX design encompasses many fields from psychology to marketing to programming and so forth. While it’s important that take onboard new techniques, it’s just as important to master your trade. As the old saying goes, practice makes perfect. How To Become a Freelance UI/UX Designer? Becoming a freelancer isn’t easy, and it certainly doesn’t happen overnight. In fact, it takes a lot of time and hard graft. But hopefully, after reading my blog post you have a clear understanding of what it takes to become a successful freelance UI/UX designer. The next step should be to identify your niche and perfect your brand. Remember, your brand and its reputation are two of the most important factors for any freelancer. Take your time, don’t rush your portfolio because you want to start making money. Once you’ve built a standout portfolio, test the waters on websites such as Upwork, PeoplePerHour, and freelancer. Gagandeep Kundi is a Content Writer with over 5 years of experience with Tech and Education industry. He's currently pursuing is masters degree in Innovation Management and writes in his free time.